The spiral galaxy NGC 908 was discovered in 1786 by William Herschel, and is considered a starburst galaxy. Clusters of young, massive stars pepper its spiral arms indicating regions of furious star formation. NGC 908 must have had a recent encounter with another galaxy; the gravitational interaction between the galaxies caused gas clouds to collapse, igniting star formation. 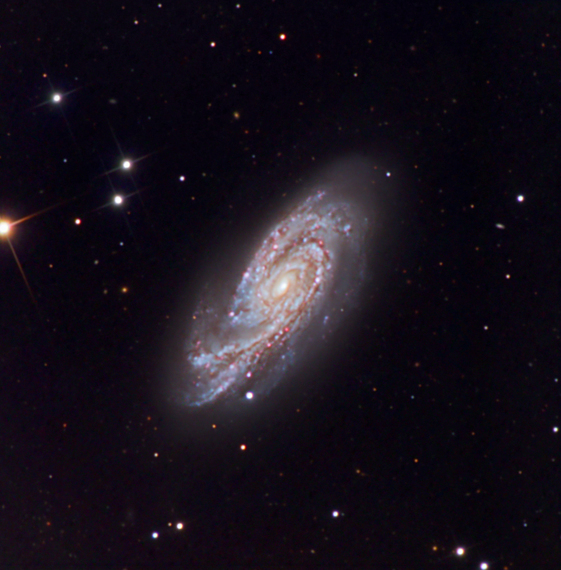 To see an excellent image on NGC 908 taken with the European Southern Observatory's Very Large Telescope, click here. To see Adam Block's version of this object, click here.